Have you ever wanted to feel like you're flying? HANGLIDING is the best way to make that dream come true! With Going on Glide we will "Foot Launch" off the mountain and glide down to the "LZ" landing zone where we will land. Did you know that the sun heats up the earth? Hot air then rises at a rate that you and your glider can soar up to the base of clouds "cloud base"! From there you can GO on GLIDE to the next thermal or back to the LZ. Solo pilots have even traveled over 400 miles by GOING on GLIDE! GOINGONGLIDE hanglinging is just a click away! 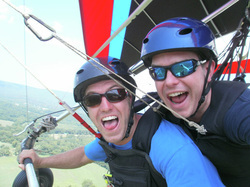 Call 423.463.6389 to fly today!